Greg Hutchings and his four-year-old daughter Eeva Dorendahl-Hutchings were last seen early Saturday afternoon. Police searching for a missing NSW father and daughter have found two bodies in dense bushland behind a Pottsville beach on the North Coast. Two bodies were located by an SES volunteer in the sand hills just before 10am, NSW Police said. Greg Hutchings, 35, and his four-year-old daughter Eeva went missing on January 11 after failing to show up for a family function on the state's north coast. Police would not confirm whether the bodies were those of the missing dad and daughter at a press conference this afternoon but said it is "certainly possible that they are our missing persons". They are treating the deaths are suspicious and would not rule out a murder-suicide as a possible line of investigation. The bodies were found together and police believe they have been dead for a considerable amount of time. Greg Hutchings and his four-year-old daughter Eeva were last seen early Saturday afternoon. "We are leaving our options open. Most certainly this is a murder investigation, without question," said Superintendent Stuart Wilkins. Officers had searched the area before but had failed to find the bodies, which were concealed in the bushland. The bodies will be handed to the coroner for formal identification. Earlier today, Mr Hutchings' mother, Diana Hutchings, and sister Sheri Hutchings visited the beach where a crime scene has been established. The pair reportedly held hands and sat close to the spot cordoned off by crime scene tape. Days after the pair went missing, Sheri Hutchings said she believed her brother had run off with his daughter in a "cry for help" out of fear he would lose custody. She suspected her brother fled after discovering his daughter's Finnish passport. "He's scared that at some stage down the track he's going to lose custody of her because her mum might take her overseas," Ms Hutchings told Nine News. Mr Hutchings had been in a custody battle with the Eeva’s mother involving Finnish authorities, but had felt "disempowered" by the process. "He has always done everything right according to what he's been told to do. I think this is maybe a cry for help or attention," she said. Two bodies were found yesterday in sand dunes not far from Ms Hutchings' Pottsville home. Although badly decomposed and yet to be formally identified, police believe they are that of the 35-year-old former chef and abattoir worker and his daughter, who was at the centre of a bitter custody dispute. "We are shocked, we need to process it and to show respect for two beautiful people," Ms Hutchings said. "We were trying to help find them, but now we just need the police to investigate. She was a beautiful girl and he was a beautiful man as well." Before their disappearance, Mr Hutchings lived at Pottsville, while his daughter lived with her mother at Kin Kin in the Sunshine Coast hinterland. Aunt of toddler Eeva Dorendhal and sister of Gary Hutchings, Sheri Hutchings, said she feels the pair are safe. "We all know how much Greg loves Eeva, if she's with him, she's safe," she said. "He would make sure she's comfortable." She said she initially believed Greg, who she said had been involved in a "power struggle" with Eeva's mother Michelle Dorendhal, had made a last minute decision to not return Eeva. "He hasn't done anything like that before," she said. "He had a lot of reasons to worry and not a lot of support from anybody." She said her brother was a beautiful father with a nurturing personality. But as the search stretches on, Ms Hutchings said she had "less and less idea" of what could have happened. "Really someone must have seen them," she said. 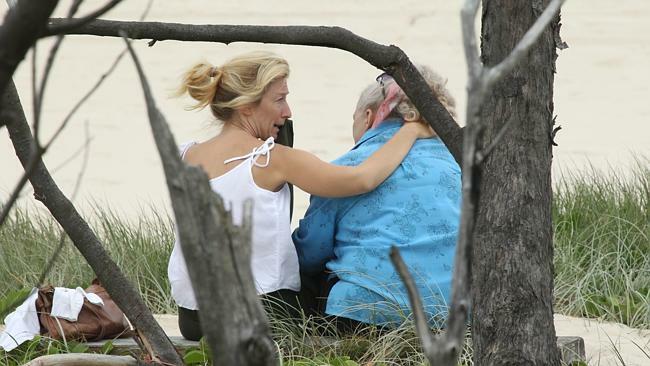 Left: Sheri Hutchings and Diana Hutchings, the sister and mother of Greg Hutchings, console one another at the crime scene in the dunes near Elfron St Pottsville. It's easy to despise Greg Hutchings, a man so selfish he would seemingly take his four-year-old daughter's life, then his own, and forever desolate the lives of the child's mother and family. It's the ultimate act of bullying. And yet in all media accounts leading up to Hutchings' death, there was no suggestion of this trait in his nature. I'm sure parents across the country reacted similarly to the news that police are investigating Eeva Dorendahl-Hutchings' death as a murder/suicide by her father: it is beyond comprehension; we struggle to think of a scenario in which we'd allow our children to die, in which we'd not give our own life fighting to stop it. For his daughter, we feel the void of loss, and for her mother, Michelle Dorendahl, true horror. It wrenches at you, makes you shudder to even imagine the suffering she is enduring. A comment on social media I read on Wednesday said: "There's a special place in hell for fathers who kill their children." My immediate thought was: "It's the mother who's in hell." Yet, somehow, that does not put a stopper on my feelings of sympathy for Hutchings and his family. I imagine him under a tree in sand dunes in the moments before he made his dreadful choice and feel desperately sad for him. I wonder how dark a road a man has to walk to get to that place, to kill his child. Hutchings did an incredibly selfish, spiteful thing but I don't consider he was evil; just broken, despairing and, perhaps, vengeful. Can we despise the act and not the man? A chaplain who has worked in our hardest jails said to me yesterday: "I've met the worst of the worst and come to the conclusion they're not much different to the best of the best. They just had different lives." I asked him, if we feel pity or sadness for Greg Hutchings are we somehow diminishing or belittling the pain felt by Michelle Dorendahl and the waste of Eeva's life? "We can still lament," he said. "There is a place for breaking our hearts without judgments or solutions." I lament for Eeva and Michelle and I want to know what pushed Hutchings so far down that dark road. How, amidst family and government agencies, he felt there was no one he could turn to. I know men and women who have walked in Hutchings' shoes and felt the dismal tug of suicide, yet never the urge to take their child with them. It was always the thought of their child that brought them back from that ledge. Hutchings' case is not isolated. It frustrates and angers me we open newspapers so regularly to find fathers acting with such cruelty and narcissism as to delude themselves their children should not live without them. matters in their child's life, and, in the ugly, egotistical poker game so many custody battles devolve into, men are too often driven by this knowledge to use children as their trump card; the ultimate revenge. I worry even writing a piece like this might suggest to men (or women) in such disputes that this is a course of action which is justifiable. It never is. But hating Hutchings won't help us understand why he acted in the way he did. If we make him wear the black hat, while we don the white, we're never going to summon the comprehension to stop this sort of crime happening. As a father who's been down a few dark paths during my own custody dispute, I know it's understanding and guidance - often from unexpected sources - that keeps you in the light. The only absolute is the child's welfare, which too often becomes a synonym for the parent feeling "good" about the situation. It's the great tragedy of the child - they cannot wholly tell you what they think and feel. A revealing commonality between Hutchings and other men who have killed their children speaks to this - the age of the child. The kids seem to be just young enough that they don't pose questions. If they were older, they would surely have asked, "What are you doing, Dad?" which may well have jarred these men into clearer thinking. I wish with all my heart Greg Hutchings had asked himself this question. Music clip: Calling All Angels by Jane Siberry & KD Lang. Also from Pay It Forward movie. No idea Pete. Have pondered why people take the life of their child/ren for a long time and while one can speculate about a myriad of causes some more obvious than others, and where fault may lay in a bid to prevent this type of thing happening again, the only answer that seems feasible is to have everybody going through a family breakup mandated to attend specially designed confidential support that focuses on the parent. Of course valuable experience should be drawn from those who have been to hell and back from the family breaking up and legal entanglement. On a legal level it should never be allowed for a parent to take a child out of the country, unless they be the sole parent. If a parent wants to go, they go on their own. If the separation process was handled and monitored properly in the community, no parent would ever want to take children away from the other parent, avoiding or at least minimising the deep loss and powerless triggers that are a precursor to the death and loss of our loving children. Dear loving Eeva, to lose such a beautiful gift as you, we are all deeply sorry we have let you down. Condolences to all the family. What led a father to do this to his daughter? What the hell went wrong with his ex, lawyers, mediation and the courts? There must be more to this story we are not being told ??? ?